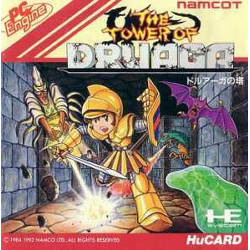 The Tower of Druaga for the PC-Engine is not a port of the original arcade game, but rather an updated remake. The update includes improved graphics with a three-quarters view of the world, expanded story line, greater character customization, and all new puzzles to solve. It was only released in Japan due to the fact that the arcade game failed to garner popularity outside of Japan. Just as in the original, you control the Babylonian hero of legend, Gilgamesh, as you guide him through all 60 floors of the tower. On nearly every floor, a treasure chest can be collected, but the method to reveal the chest is different for each floor. Unlike the arcade, the goddess Isthar is present to provide players with hints that guide them in the right direction so that they can succeed, although the Pro game leaves the player to their own devices. The way items and equipment work are substantially different. Gil can choose which components of armor he wears, out of all those that he has collected. He must also select and activate particular items when he wishes to use them (much like Link does in The Legend of Zelda). And finally, throughout the Easy and Normal levels of difficulty, the player can assign and reassign spirit points to particular attributes of Gil's, in order to customize him any way the player wishes. 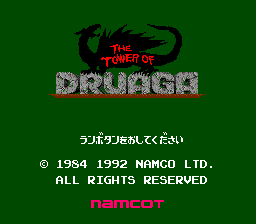 A patch to translate the ROM file of this game from Japanese to English has been released. It can be found at Romhacking.net on this page. The author of the patch was StrategyWiki's own Procyon. The city of Babylon, near the Euphrates River, was protected by the gods. The Blue Crystal Rod was safely contained in heaven, out of harm's reach, and shined its peaceful light down on Babylon. The prince of Babylon, Gilgamesh was in love with a Maiden of Goddess Ishtar, named Ki. One terrible day, the kingdom of Sumeria raided Babylon and conquered them. They enslaved the Babylonians and put them to work for their nefarious purposes. Their ambition was to build a tower that would reach up to heaven, and steal the Crystal Rod for themselves. Seeing their brazen ways, Anu leads the gods in an attempt to destroy the tower with thunder, damaging parts of the structure, but it is too late. The demon Druaga has been spying on the tower's construction, and as soon as its abandoned, claims the tower for his own. He rebuilds the tower and resides inside, scheming of a way to get the Crystal Rod as well. Ishtar appears to Gil in a dream. "Gilgamesh, Ki is crying. She is struggling to get to the top of the tower on her own because she knows that she must get the Crystal Rod before Druaga does!" Gil wakes up and is visited by a shadowy stranger. "Druaga has caught Ki," he says. Just before vanishing, he adds "If you want her back, you must use the power of your sword." This page was last edited on 24 October 2012, at 15:25.